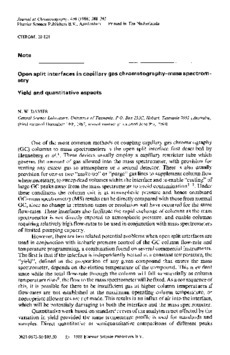 One of the most common methods of coupling capillary gas chromatography (GC) columns to mass spectrometers is the open split interface first described by Henneberg et al. These devices usually employ a capillary restrictor tube which governs the amount of gas allowed into the mass spectrometer, with provision for venting any excess gas to atmosphere or a second detector. There is also usually provision for one or two "make-up" or "purge" gas lines to supplement column flow where necessary, to sweep dead volumes within the interface and to enable "cutting" of large GC peaks away from the mass spectrometer to avoid contamination. Under these conditions the column exit is at atmospheric pressure and hence combined GC-mass spectrometry (MS) results can be directly compared with those from normal GC, since no change in retention times or resolution will have occurred for the same flow-rates. These interfaces also facilitate the rapid exchange of columns as the mass spectrometer is not directly exposed to atmospheric pressure, and enable columns requiring relatively high flow-rates to be used in conjunction with mass spectrometers of limited pumping capacity.